Riteman's family confirmed he died in his sleep Wednesday morning at his home in Halifax. The concentration camp survivor spent more than 20 years of his life speaking to students, reporters, business associations about what he endured during the Holocaust. 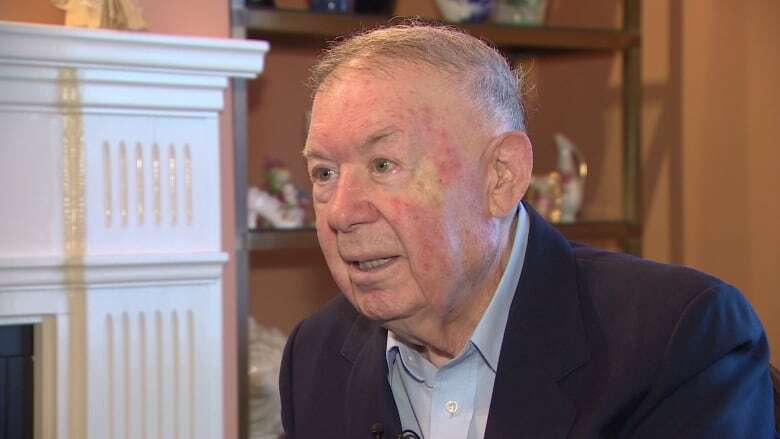 Holocaust survivor Philip Riteman died in his sleep at his home in Halifax Wednesday morning, his family has confirmed. He was 96. Riteman survived the concentration camps at Auschwitz and Dachau and he spoke about what he endured during the Holocaust with thousands of students, reporters, business associations and community groups for more than 20 years. "He came through hell and really showed that people can rise above and live a more compassionate and fuller life than most people ever live in their lives. That's the real legacy," said Larry Riteman, Philip's son. Many people across Nova Scotia would have remembered Riteman visiting their school or organization to share his story. One of the most moving parts of his presentation was when he showed his prison tattoo number: 98706. Philip Riteman grew up in Poland. When he was a teenager, his Jewish family was captured by the German government and sent to Auschwitz. His parents and his seven brothers and sisters were among the millions of people killed in the Holocaust. He emigrated to Newfoundland and Labrador in 1946 and did not speak about his experience in the concentration camps for 40 years. Larry Riteman said his father started talking about what happened to him in the 1980s, when Holocaust deniers started making the news. "The [Ernst] Zündel trial, Malcolm Ross and all that sort of thing. And that was when he really felt he had to start telling people what had happened," Riteman said. "Because there was a lot of people that were insinuating that the Germans weren't that bad or that the Holocaust was greatly exaggerated or it didn't happen at all. "And he knew he had to counter that. So he got out and he told people what he endured. And he relived it every time he told it ... it was clear he had seen something absolutely awful. Most people have no grasp," Riteman said. Holocaust survivor Philip Riteman honoured by adopted home of N.L. Riteman's story was shared in the biography, Millions of Souls: The Philip Riteman Story. He shared his story for two reasons: to make sure the Holocaust and its victims were remembered and to prevent it from happening again. Riteman's wife Dorothy, whom he was married to for 68 years, said his message was simple: "It is better to love than to hate." Larry Riteman said his father's health was in decline for weeks. He said the family is spending time together. "That he lasted as long as he did was more a tribute to his strength than anything else," Riteman said. On Thursday, Premier Stephen McNeil said Riteman was a "tremendous educator" who "taught us all about humanity, the good and the bad." "He was challenging all of us to ensure that we become the voice to our children and to the next generation of our province and country and world that evil lurks around us," McNeil said. "And we need to be vigilant to ensure that it doesn't happen." Funeral services for Riteman were Thursday afternoon.